A new study finds that countries around the world could shift their economies entirely to renewable energy sources, such as solar, wind and hydroelectric, by the year 2050. The researchers map out the blend of energy sources that each of 139 countries would need to completely switch their energy to electric power. The report was first published in the journal Joule.“The idea here is to electrify all energy sectors — transportation, heating, cooling, industry, agriculture, forestry, and fishing — and provide that electricity with 100 percent wind, water and solar power,” says Mark Z. Jacobson, a professor of civil and environmental engineering at Stanford and one of the authors of the report. “We want [to see] 80 percent of it by 2030 and 100 percent by 2050. … It is a challenge, but it’s very important to do,” he insists. Some countries will have a more difficult time than others, but Jacobson says for the bigger countries the transition should be easier than he thought. Big countries have plenty of solar and wind resources, and just by electrifying they will reduce power demand because they eliminate the need to mine, transport, or refine fossil fuels. Thirteen percent of all energy worldwide is used for just this purpose. An additional 23 percent reduction in power demand can happen because electricity is more efficient than combustion, Jacobson says. An electric car, for example, uses 80 percent to 86 percent of its electricity to move the car, with the rest being waste heat. Only 17% to 20% of the energy in a gasoline car goes to moving it; the rest is waste. Thirteen percent plus 23 percent equals a 36 percent power-demand reduction, and Jacobson believes another 7 percent will occur due to end-use energy efficiency. 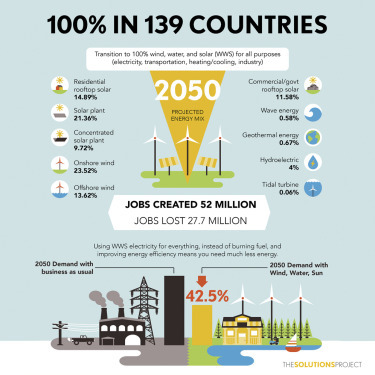 So, compared to what 2050 would look like without changing to renewables, nations can reduce their power demand by almost 43 percent, just through electrification. In the US, the power source blend will be mostly solar and wind, with about 4 percent hydroelectric, Jacobson believes. For wind, about two-thirds will be onshore and one-third offshore. Solar will be divided into rooftop solar, photovoltaics and centralized “concentrated solar power” plants, coupled with storage. In most cases, the electrical grid will need to be expanded, not necessarily changed, Jacobson notes. Specifically, we will need more long-distance, high-voltage direct current transmission and more storage. Since the Midwest is considered the “Saudi Arabia of wind,” in some cases it might be cheaper to transmit power to the East Coast rather than use offshore wind. On the other hand, offshore wind costs are coming down so rapidly that it could end up being cheaper. Floating offshore wind farms, which are becoming more feasible, could also be a game-changer, Jacobson says. On the local scale, there are already things people can do in their own home to help the transition to clean power, like replacing gas stoves with induction cook-top stoves that are extremely efficient, Jacobson says. Add in electric cars, solar panels and batteries that can be stored in the home and people won’t even need grid electricity most of the time — and prices for all of these things are coming down rapidly. Industry will find the process somewhat more difficult, Jacobson says, especially for the high-temperature industrial processes that currently use fossil fuels. But, again, electric machines exist that can replace the old ones, he says. For the world to reverse global warming, eliminate millions of annual air-pollution deaths, and provide secure energy, every country must have an energy roadmap based on widely available, reliable, zero-emission energy technologies. This study presents such roadmaps for 139 countries of the world. These roadmaps are far more aggressive than what the Paris agreement calls for, but are still technically and economically feasible. The solution is to electrify all energy sectors (transportation, heating/cooling, industry, agriculture/forestry/fishing) and provide all electricity with 100% wind, water, and solar (WWS) power. If fully implemented by 2050, the roadmaps will enable the world to avoid 1.5°C global warming and millions of annual air-pollution deaths, create 24.3 million net new long-term, full-time jobs, reduce energy costs to society, reduce energy end-use by 42.5%, reduce power disruption, and increase worldwide access to energy. We develop roadmaps to transform the all-purpose energy infrastructures (electricity, transportation, heating/cooling, industry, agriculture/forestry/fishing) of 139 countries to ones powered by wind, water, and sunlight (WWS). The roadmaps envision 80% conversion by 2030 and 100% by 2050. WWS not only replaces business-as-usual (BAU) power, but also reduces it ∼42.5% because the work: energy ratio of WWS electricity exceeds that of combustion (23.0%), WWS requires no mining, transporting, or processing of fuels (12.6%), and WWS end-use efficiency is assumed to exceed that of BAU (6.9%). Converting may create ∼24.3 million more permanent, full-time jobs than jobs lost. It may avoid ∼4.6 million/year premature air-pollution deaths today and ∼3.5 million/year in 2050; ∼$22.8 trillion/year (12.7 ¢/kWh-BAU-all-energy) in 2050 air-pollution costs; and ∼$28.5 trillion/year (15.8 ¢/kWh-BAU-all-energy) in 2050 climate costs. Transitioning should also stabilize energy prices because fuel costs are zero, reduce power disruption and increase access to energy by decentralizing power, and avoid 1.5°C global warming. The seriousness of air-pollution, climate, and energy-security problems worldwide requires a massive, virtually immediate transformation of the world’s energy infrastructure to 100% clean, renewable energy producing zero emissions. For example, each year, 4–7 million people die prematurely and hundreds of millions more become ill from air pollution,1,2 causing a massive amount of pain and suffering that can nearly be eliminated by a zero-emission energy system. Similarly, avoiding 1.5°C warming since preindustrial times requires no less than an 80% conversion of the energy infrastructure to zero-emitting energy by 2030 and 100% by 2050 (Timeline and Section S10.2). Lastly, as fossil-fuel supplies dwindle and their prices rise, economic, social, and political instability may ensue unless a replacement energy infrastructure is developed well ahead of time. More specifically, we estimate 2050 annually averaged power demand for 139 countries before and after all energy sectors have been electrified. We then perform a renewable resource analysis with multiple datasets in each country and use it to help determine one of many possible mixes of clean, renewable generators that can satisfy the annual demand. The generators are almost all commercially available solar, wind, hydropower, and geothermal technologies, except that we assume that two technologies not yet widely used, tidal and wave power, are installed in small amounts in a few countries. Similarly, most of the electric technologies that we propose for replacing fossil-fuel technologies are already commercial on a large scale today (e.g., electric heat pumps for air and water heating, induction cooktops, electric passenger vehicles, electric induction furnaces, electric arc furnaces, dielectric heaters), but a few are still being designed for commercial use (e.g., electric aircraft and hybrid hydrogen fuel cell-electric aircraft). We then draw on a previous analysis to estimate the additional energy-storage capacity needed for balancing time-dependent supply and demand during a year. The present study does not examine grid stability, since it is evaluated in separate work (see Matching Electric Power Supply with Demand and Section S7). Finally, we estimate the land and ocean footprint and spacing areas required for the WWS scenario plus the energy costs, air-pollution damage costs, climate costs, and job creation/loss for the WWS versus BAU scenarios. With this information, we evaluate whether each country can technically (with the country’s available renewable resources and with existing plus developing technologies) and economically meet annual average power demand while providing environmental benefits and jobs. Policy measures to implement the roadmaps and a transition timeline. Moreover, the Intergovernmental Panel on Climate Change (IPCC,24 p. 517) concludes that there is “robust evidence” and “high agreement” that “Barriers to and risks associated with an increasing use of nuclear energy include operational risks and the associated safety concerns, uranium mining risks, financial and regulatory risks, unresolved waste management issues, nuclear weapons proliferation concerns, and adverse public opinion.” As such, expanding the use of nuclear to countries where it does not exist may increase weapons proliferation and meltdown risks. More advanced nuclear cannot be evaluated fully until it is commercialized but will likely have some if not several of the issues associated with current nuclear, including waste storage and disposal, accident risks, and weapons proliferation risks. There is no known way at this time to eliminate these risks. By contrast, WWS technologies have none of these risks. Thus, we are proposing and evaluating a system that we believe provides the greatest environmental benefits with the least risk. Even though tidal and wave power are not widely used, they have been used for power generation in the open ocean for years, have been evaluated to be clean and to present no health risk to humans, and produce power with less time variation than offshore wind so would complement the other resources proposed here if they can be scaled up. Similarly, electric and hydrogen fuel cell hybrid commercial aircraft technologies already exist in small prototypes and in passenger cars, and we do not propose their full development until 2035–2040, whereas we need clean electric power resources starting today. In summary, we focus on WWS technologies, which at least appear possible to solve critical environmental problems in a timely manner. Whether the roadmaps are implemented rapidly, however, depends on social and political factors. Tables 1 and S6 (for all countries) provide one possible scenario of 139-country BAU and WWS end-use power demand (load) in 2050. End-use load is the power in delivered electricity or fuel that is actually used to provide services such as heating, cooling, lighting, and transportation. It excludes losses during electricity or fuel production and transmission but includes industry self-energy-use for mining, transporting, and refining fossil fuels. All end uses that can be electrified use WWS power directly; however, some transportation uses hydrogen produced from WWS electricity (Methods). The last column shows the total percent reduction in 2050 BAU end-use load due to switching to WWS, including the effects of reduced energy use due to (a) the higher work to energy ratio of electricity over combustion, (b) eliminating energy industry self-use for the upstream mining, transporting, and/or refining of coal, oil, gas, biofuels, bioenergy, and uranium, and (c) assumed policy-driven increases in end-use energy efficiency beyond those in the BAU case. Supplemental Information Section S3 describes the methodology; Table S6 contains individual country values. Assumed modest additional policy-driven energy-efficiency measures beyond those under BAU. These factors decrease average demand ∼23.0%, 12.6%, and 6.9%, respectively, for a total of 42.5%. Thus, WWS not only replaces fossil-fuel electricity directly but is also an energy-efficiency measure, reducing demand. Table 2 summarizes the numbers of WWS generators needed to power all 139 countries in 2050 for all energy purposes assuming the end-use loads by country in Table S6 and the percent of each country’s load met by each generator in Table S8. The numbers of generators were derived accounting for power loss during transmission, distribution, and generator maintenance; and competition among wind turbines for limited kinetic energy (array losses). The numbers also assume all power for a country is generated and used in the country in the annual average, and thus ignore cross-border transfers of energy that will occur in reality. All values are summed over 139 countries. Delucchi et al.26 provide values for individual countries. Annual average power is annual average energy divided by the number of hours per year. 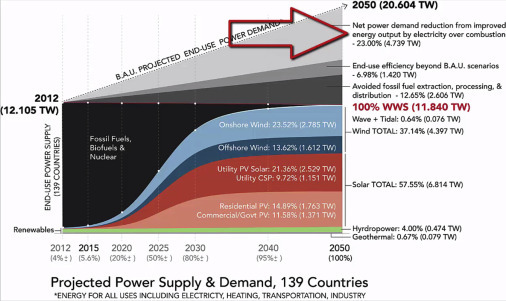 Total end-use load in 2050 with 100% WWS is from Table 1. Land area for each country is given in Delucchi et al.26 139-country land area is 119,651,632 km2. The average capacity factors of hydropower plants are assumed to increase from their current world average values of ∼42% up to 50.0%. The solar PV panels used for this calculation are Sun Power E20 panels. For footprint calculations alone, the CSP mirror sizes are set to those at Ivanpah. CSP is assumed to have storage with a maximum charge to discharge rate (storage size to generator size ratio) of 2.62:1. See Table S7 footnote for more details. The footprint area requiring new land equals the sum of footprints for new onshore wind, geothermal, hydropower, and utility solar PV. Offshore wind, wave, and tidal generators are in water, thus do not require new land. Similarly, rooftop solar PV does not use new land so has zero new land footprint. Only onshore wind requires new land for spacing area. See Section S5.1.1 for how spacing area is calculated and compares with data. Spacing area can be used for multiple purposes, such as open space, agriculture, grazing, etc. The installed capacities for peaking power/storage are estimated from Jacobson et al.4 Additional CSP is CSP plus storage needed beyond that for annual average power generation to firm the grid across all countries. Additional solar thermal and geothermal heat are used for direct heat or heat storage in soil. Jacobson et al.4 also use other types of storage. Table S22 summarizes 2050 rooftop areas, supportable PV capacity, and installed rooftop PV used by country, summed over the 139 roadmaps developed here. Rooftop PV will go on rooftops or elevated canopies above parking lots, highways, and structures without requiring additional land. In 2050, residential rooftops (including garages and carports) among the 139 countries may support up to 26.6 TWdc-peak of installed power, of which 34.9% is proposed for use. Commercial/government rooftops (including parking lots and parking structures) may support 11.1 TWdc-peak, of which 68.2% is proposed for use. Low-latitude and high GDP-per-capita countries are hypothesized to adopt proportionately more PV than high-latitude, low GDP-per-capita countries. While utility-scale PV can operate in any country, because it can use direct and diffuse sunlight, CSP is viable only where significant direct sunlight exists. Thus, CSP penetration in several countries is limited (Section S5.2.4). Onshore wind is available in every country but assumed to be deployed aggressively primarily in countries with good wind resources and sufficient land (Section S5.1.1). Offshore wind is assumed viable in the 108 out of 139 countries with ocean or lake coastline (Section S5.1.2). In most of these countries, the technical potential installed capacity is determined from the area of coastal water less than 60 m depth and with a capacity factor of at least 34% in the annual average. The 2050 nameplate capacity of hydropower is assumed to be the same as in 2015. However, existing hydropower is assumed to run at slightly higher capacity factor (Section S5.4). This assumption is justified by the fact that in many places, hydropower use is currently suppressed by the availability and use of gas and coal, which will be eliminated here. If current capacity factors are limited by low rainfall, it may also be possible to make up for the deficit with additional run-of-the-river hydro, pumped hydro, or non-hydro WWS energy sources. 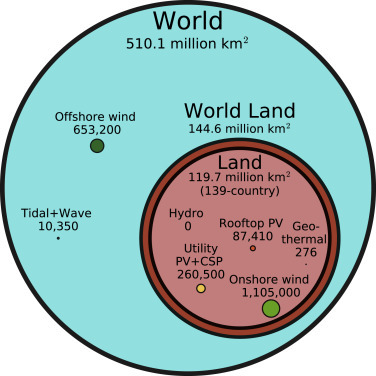 Geothermal, tidal, and wave power are limited by each country’s technical potentials (Sections S5.3, S5.5, S5.6). Table 2 also lists needed installed capacities of additional CSP with storage, new solar thermal collectors, and existing geothermal heat installations. These collectors are needed to provide electricity or heat that is mostly stored for peaking power (Section S7). Table 2 indicates that 4.26% of the 2050 nameplate capacity required for a 100% all-purpose WWS system among the 139 countries was already installed as of the end of 2015. The countries closest to 100% installation are Tajikistan (76.0%), Paraguay (58.9%), Norway (35.8%), Sweden (20.7%), Costa Rica (19.1%), Switzerland (19.0%), Georgia (18.7%), Montenegro (18.4%), and Iceland (17.3%). China (5.8%) ranks 39th and the United States (4.2%) ranks 52nd (Figure S2). Footprint is the physical area on the top surface of soil or water needed for each energy device. It does not include areas of underground structures. Spacing is the area between some devices, such as wind, tidal, and wave turbines, needed to minimize interference of the wake of one turbine with others downwind. The total new land footprint required for the 139 countries is ∼0.22% of the 139-country land area (Table 2), mostly for utility PV. This does not account for the decrease in footprint from eliminating the current energy infrastructure, which includes footprints for continuous mining, transporting, and refining fossil fuels and uranium and for growing, transporting, and refining biocrops. WWS has no footprint associated with mining fuels, but both WWS and BAU energy infrastructures require one-time mining for raw materials for new plus repaired equipment construction. The only spacing over land needed is between onshore wind turbines and requires ∼0.92% of the 139-country land area (Figure 1). The installed spacing area density of onshore and offshore wind turbines assumed here is less than indicated by data from dozens of wind farms worldwide (Section S5.1.1), thus spacing requirements may be less than proposed here. Table 2 gives the corresponding percentage of 139-country land area. For hydropower, the new footprint plus spacing area is zero since no new installations are proposed. For rooftop PV, the circle represents the additional area of 2050 rooftops that needs to be covered (thus does not represent new land). In this section, current and future full social costs (including capital, land, operating, maintenance, storage, fuel, transmission, and externality costs) of WWS electric power generators versus non-WWS conventional fuel generators are estimated. These costs include the costs of CSP storage, solar collectors for underground heat storage in rocks and boilers, and all transmission/distribution costs, including additional short-distance A/C lines and long-distance high-voltage D/C lines. We do not include here the cost of underground storage in rocks (apart from the cost of the solar collectors), the cost of pumped hydro storage, the cost of heat and cold storage in water and ice, or the cost of hydrogen fuel cells, but the section Matching Electric Power Supply with Demand provides a brief discussion that includes these costs. The total up-front capital cost of the 2050 WWS system (for annual average power plus the peaking power and storage infrastructure listed in Table 2) for the 139 countries is ∼$124.7 trillion for the 49.9 TW of new installed capacity needed (∼$2.5 million/MW). This compares with ∼$2.7 million/MW for the BAU case. In addition, WWS has zero fuel costs, whereas BAU has non-zero fuel cost. To account for these factors plus operation/maintenance, transmission/distribution, and storage costs, the levelized cost of energy (LCOE) is needed. The 2050 LCOEs, weighted among all electricity generators and countries in the BAU and WWS cases, are 9.78 ¢/kWh-BAU-electricity and 8.86 ¢/kWh-WWS-all-energy, respectively (Table S34), excluding at this point any costs for peaking and storage. Taking the product of the first number and the kWh-BAU in the retail electricity sector, subtracting the product of the second number and the kWh-WWS-electricity replacing BAU retail electricity, and subtracting the amortized cost of energy-efficiency improvements beyond BAU improvements in the WWS case, gives a 2050 business cost saving due to switching from BAU to WWS electricity of ∼$115/year per capita ($2013 USD). Estimating an additional 0.8 ¢/kWh-WWS-electricity for peaking and storage in the BAU retail electricity sector from Jacobson et al.4 gives a WWS approximate business cost of ∼9.66 ¢/kWh-WWS-electricity, still providing ∼$85/year per capita savings for WWS relative to just BAU’s retail electricity sector. In the present study, we first calculate the baseline number of electric power generators of each type needed to power each country based on the 2050 annually averaged WWS load in the country after all sectors have been electrified but before considering grid reliability and neglecting energy imports and exports. We then use data from a 2015 grid-integration study for the US4 to make a first-guess estimate of the additional electricity and heat generators needed in each country to ensure a reliable regional electric power grid (Table 2). Such estimates are then used as starting points in a separate, follow-up grid-integration study for 139 countries. Although no information from the separate 139-country grid-integration study feeds back to the present study, results from that grid-integration study are briefly described here next to provide an idea of the 139-country average energy cost to keep the grid stable with 100% WWS. In M.Z.J., M.A.D., M.A.C., and B.V. Mathiesen, unpublished data, each of the 139 countries is allocated to one of 20 world regions. The numbers of wind and solar generators determined from the present study are input into the GATOR-GCMOM climate model4 in each country. The model predicts the resulting wind (onshore, offshore) and solar (PV, CSP, thermal) resources worldwide every 30 s for 5 years, accounting for extreme weather events, competition among wind turbines for kinetic energy, and the feedback of extracted solar radiation to roof and surface temperatures. The LOADMATCH grid-integration model4 then combines the wind and solar resource time series with estimated time series for other WWS generators; hourly load data for each country; capacities for low-cost heat storage (in underground rocks and water), cold storage (in ice and water), electricity storage (in CSP with storage, pumped hydropower, batteries, and hydropower reservoirs), and hydrogen storage; and demand-response to obtain low-cost, zero-load loss grid solutions for each of the 20 grid regions. In that study, it was found that matching large differences between high electrical demand and low renewable supply could be realized largely by using a combination of either (1) substantial CSP storage plus batteries with zero change in existing hydropower annual energy output or peak power discharge rate, (2) modest CSP storage with no batteries and zero change in the existing hydropower annual energy output but a substantial increase in hydropower’s peak discharge rate, (3) increases in CSP-storage, batteries, and heat pumps, but no thermal energy storage and no increase in hydropower’s peak discharge rate or annual energy output, or (4) a combination of (1), (2), and (3). Thus, there were multiple solutions for matching peak demand with supply 100% of the time for 5 years without bioenergy, nuclear, power, fossil fuels with carbon capture, or natural gas. In one set of simulations from M.Z.J., M.A.D., M.A.C., and B.V. Mathiesen, unpublished data, the resulting total costs of delivered 100% WWS energy, including generation, storage, short- and long-distance transmission, distribution, and maintenance, across all 139 countries in all 20 regions, was 10.6 (8.1–14) ¢/kWh-all-energy (USD, 2013) and 9.8 (7.9–12) ¢/kWh-WWS- electricity, the latter of which compares with the rough estimate of 9.7 ¢/kWh-WWS-electricity from the section Energy Costs here. The costs avoided due to reducing air-pollution mortality in each country are quantified as follows. Global 3D modeled concentrations of PM2.5 and O3 in each of 139 countries are combined with the relative risk of mortality as a function of concentration and population in a health-effects equation.27 Results are then projected to 2050 accounting for increasing population, increasing emission sources, and increasing emission controls (Section S8.1). Resulting contemporary worldwide outdoor plus indoor premature mortalities over the 139 countries are ∼4.28 (1.2–7.6) million/year for PM2.5, ∼0.28 (0.14–0.42) million/year for O3, and ∼4.56 (1.33–7.98) million/year for both. Premature mortalities over the whole world are ∼4.97 (1.45–8.65) million/year for both pollutants (Figure S12), which compares with 4–7 million/year (outdoor plus indoor) worldwide from other studies.1,2,28-30 Premature mortalities derived for 2050 here are ∼3.5 (0.84–7.4) million/year for the 139 countries (Table S36). Global-warming costs include costs due to coastal flooding and real-estate damage; agricultural loss; health problems due to enhanced heat stress and stroke, air pollution, influenza, malaria, and dengue fever; enhanced drought, wildfires, water shortages, famine, and flooding; ocean acidification; and increased severe weather. In some regions, these costs are partly offset by fewer extreme cold events, associated reductions in illness and mortality, and gains in agriculture. Net costs due to global-warming-relevant emissions are embodied in the social cost of carbon dioxide, which is estimated for 2050 from recent studies as $500 ($282–1,063)/metric tonne-CO2e in 2013 USD.7 Applying this range to estimated 2050 CO2e emissions suggests that 139-country emissions may cause $28.5 ($16.1–60.7) trillion/year in climate damage to the world by 2050, or 15.8 (8.9–34) ¢/kWh-BAU-all-energy and ∼$3,200/year per person (in 2013 USD) (Section S8.2; Tables S34 and S40). Changes in job numbers and earnings resulting from building out 100% of the WWS electricity generation and transmission systems needed by 2050 are estimated with NREL’s Jobs and Economic Development Impact (JEDI) models.31 The models account for onsite “direct” jobs, local revenue and supply chain “indirect” jobs, and “induced” jobs from the spending and reinvestment of earnings from direct and indirect jobs. The build-out of the WWS generation and transmission infrastructure produces jobs during construction and operation. All job numbers provided here are permanent, full-time (2,080 hr/year) jobs. Permanent direct, indirect, and induced construction jobs are calculated assuming that 1/L of total installed capacity is built or replaced every year, where L is the average facility life (Section S9.1.2). Upon replacement of each facility, new construction jobs are needed. As such, construction jobs continue permanently. Job estimates do not include job changes in industries outside of electric power generation (e.g., the manufacture of electric vehicles, fuel cells, or electricity storage), as it is uncertain where those jobs will be located and the extent to which they will be offset by losses in BAU-equivalent industries. Results indicate that 100% conversion to WWS across 139 countries can create ∼25.4 million new ongoing full-time construction-related jobs and ∼26.6 million new full-time, ongoing operation- and maintenance-related jobs, totaling 52.0 million new ongoing jobs for WWS generators and transmission (Table S42). Tables S42 and S45 summarize the resulting 139-country job losses in the oil, gas, coal, nuclear, and bioenergy industries. Because WWS plants replace BAU fossil, nuclear, bioenergy, and BAU-WWS plants, jobs lost from not constructing BAU plants are also included. Jobs lost from the construction of petroleum refineries and oil and gas pipelines are also counted. Shifting to WWS is estimated to result in ∼27.7 million jobs lost in the current fossil-fuel, biofuel, and nuclear industries, representing ∼0.97% of the 2.86 billion 139-country workforce. In summary, WWS may create a net of ∼24.3 million permanent, full-time jobs across the 139 countries. Whereas the number of operation jobs declines slightly, the number of permanent, continuous construction jobs far more than makes up for the loss (Table S42). Individually, countries that currently extract significant fossil fuels (e.g., Algeria, Angola, Iraq, Kuwait, Libya, Nigeria, Qatar, and Saudi Arabia) may experience net job loss in the energy production sector. These losses can be offset by the manufacture, service, and export of technologies associated with WWS energy (e.g., liquid hydrogen production and storage, electric vehicles, electric heating and cooling, etc.). Those offsetting jobs are not included in the job numbers here. Collectively, the direct and indirect earnings from producing WWS electricity/transmission across 139 countries amount to ∼$1.86 trillion/year during construction and ∼$2.06 trillion/year during operation. The annual fossil-fuel earnings loss is ∼$2.06 trillion/year, yielding a net ∼$1.86 trillion/year gain (Table S42). Figure 2 is a proposed WWS transformation timeline for the 139 countries. It assumes 80% conversion to WWS by 2030 and 100% by 2050. The rate of transformation is based on what is necessary to eliminate air-pollution mortality as soon as possible, what is needed to avoid 1.5°C net global warming, and what we estimate is technically and economically feasible. Total power demand decreases upon converting to WWS. The percentages next to each WWS source are the final (2050) estimated percent supply of end-use power by the source. The 100% demarcation in 2050 indicates that 100% of all-purpose power is provided by WWS technologies by 2050, and the power demand by that time has decreased. In the WWS scenario, 80% conversion occurs by 2030. Figure360: an author presentation of Figure 2. Friedlingstein et al.32 estimate that, for the globally averaged temperature change since 1870 to increase by less than 2°C with a 67% or 50% probability, cumulative CO2 emissions since 1870 must stay below 3,200 (2,900–3,600) Gt-CO2 or 3,500 (3,100–3,900) Gt-CO2, respectively. This accounts for non-CO2 forcing agents affecting the temperature response as well. Matthews33 further estimates the emission limits needed to keep temperature increases under 1.5°C with probabilities of 67% and 50% as 2,400 Gt-CO2 and 2,625 Gt-CO2, respectively. As of the end of 2015, ∼2,050 Gt-CO2 from fossil-fuel combustion, cement manufacturing, and land use change had been emitted cumulatively since 1870,33 suggesting no more than 350–575 Gt-CO2 can be emitted for a 67%–50% probability of keeping post-1870 warming under 1.5°C. Given the current and projected global emission rate of CO2, it is necessary to cut energy and land use change emissions yearly until emission cuts reach 80% by 2030 and 100% by 2050 to limit warming to 1.5°C with a probability of between 50% and 67% (Section S10.2). Section S10.1 lists proposed timeline milestones by energy sector, and Section S11 identifies some of many potential transition policies to select from. Whereas much new WWS infrastructure can be installed upon natural retirement of BAU infrastructure, new policies are needed to force remaining existing infrastructure to be retired early to allow the complete conversion to WWS. Because the fuel, operating, and external costs of continuing to use existing BAU fossil-fuel capacity are, in total, much greater than the full annualized capital-plus-operating costs of building new WWS plants (indeed, the climate and air-pollution costs alone of BAU infrastructure, 28.5 [11.2–72] ¢/kWh-BAU-all-energy, exceed the full cost of new WWS infrastructure), and because substitution of WWS for BAU energy systems increase total jobs, it is beneficial to society to immediately stop operating existing BAU fossil-fuel plants and replace them with new WWS plants. Transitioning 139 countries to 100% WWS has the potential to (1) avoid ∼4.6 (1.3–8.0) million premature air-pollution mortalities/year today and 3.5 (0.84–7.4) million/year in 2050, which along with non-mortality impacts, avoids ∼$23 ($4.1–69) trillion/year in 2050 air-pollution damage costs (2013 USD); (2) avoid ∼$28.5 ($16.1–60.7) trillion/year in 2050 global-warming costs (2013 USD); (3) avoid a total health plus climate cost of ∼28.5 (11.2–72) ¢/kWh-BAU-all-energy, or $5,800/year per person, over 139 countries; (4) save ∼$85/person/year in BAU-electricity-sector fuel costs; (5) create ∼24.3 million net new permanent, full-time jobs; (6) stabilize energy prices; (7) use minimal new land (0.22% of 139-country land for new footprint and 0.92% for new spacing); (8) enable countries to produce as much energy as they consume in the annual average; (9) increase access to distributed energy by up to 4 billion people worldwide currently in energy poverty; and (10) decentralize much of the world power supply, thereby reducing the risk of large-scale system disruptions due to machinery breakdown or physical terrorism (but not necessarily due to cyber attack). Finally, the aggressive worldwide conversion to WWS proposed here may help avoid global temperature rising more than 1.5°C since 1870. While social and political barriers exist, converting to 100% WWS using existing technologies is technically and economically feasible. Reducing the barriers requires disseminating information to make people aware about what is possible, effective policies (Section S11), and individuals taking actions to transition their own homes and lives. Quantifying the numbers of WWS generators in each country begins with 2012 energy-use data3 in each energy sector of 139 countries for which data are available. Energy use in each sector of each country is projected to 2050 from the 2012 data in a BAU scenario (Section S3.2). The projections account for increasing demand; modest shifts from coal to natural gas, biofuels, bioenergy, and some WWS; and some end-use energy-efficiency improvements. All energy-consuming processes in each sector are then electrified, and the resulting end-use energy required for a fully electrified all-purpose energy infrastructure is estimated (Section S3.3). Some end-use electricity is used to produce hydrogen for long-distance ground, ship, and air transportation. Modest assumed additional end-use energy-efficiency improvements are then applied. The remaining power demand is supplied with a combination of different WWS technologies determined by available natural resources and the rooftop, land, and water areas in that country. Technologies for ground transportation include battery electric vehicles (BEVs) and BEV-hydrogen fuel cell (HFC) hybrids, where the hydrogen is electrolytic (produced by electrolysis or passing electricity through water). BEVs with fast charging (an existing commercial technology) dominate short- and long-distance, light-duty ground transportation, construction machines, agricultural equipment, short- and moderate-distance trains, short-distance boats and ships (e.g., ferries, speedboats), and aircraft traveling less than 1,500 km. BEV-HFCV hybrids dominate medium- and heavy-duty trucks and long-distance trains, ships, and aircraft. HFCs are not used to generate electricity due to the relative inefficiency and associated costs of this application. In this study, ∼7.0% of all 2050 WWS electricity (43.6% of the transportation load) is for producing, storing, and using hydrogen. Currently, several companies are developing electric commercial aircraft for travel up to 1,500 km, and a four-seat HFC aircraft with a range of 1,500 km has been developed (Section S2). We believe such technology can become mature by 2035 and 2040, respectively, by the time we propose that they comprise all new aircraft (Section S10.1). Air heating and cooling are powered by ground-, air-, or water-source electric heat pumps. Water heat is generated by heat pumps with an electric resistance element for low temperatures and/or solar hot water preheating. Cook stoves are electric induction. Electric arc furnaces, induction furnaces, and dielectric heaters are used to power high-temperature industrial processes directly. Conceptualization, M.Z.J. and M.A.D. ; Software, M.A.D., M.Z.J., Z.A.F.B., S.C.G., W.E.C., Methodology, M.Z.J. and M.A.D. ; Supervision, M.Z.J. and M.A.D. ; Investigation, M.A.D., M.Z.J., Z.A.F.B, S.C.G., W.E.C., M.A.C., C.B., L.C., H.A.C., P.E., J.R.E., S.N.F., O.K.G., E.M.H., J. Liu, J. Lo, C.B.M., S.B.M., K.R.M., P.L.O., I.P., S.R., R.S., M.A.S., J.W., E.W., A.S.Y. ; Writing – Original Draft, M.A.D., M.Z.J. ; Writing – Review & Editing, M.Z.J., M.A.D., M.A.C., P.E. ; Visualization, M.Z.J. and M.A.C. We would like to thank The Solutions Project for partial funding of three students. We would like to thank Karl Burkart for developing the timeline graphic for this paper. Document S1. Supplemental Experimental Procedures, Figures S1–S10, and Tables S1–S45.